The Yellowstone operation received the award for its development of a new green energy source in the park. An employee team designed and implemented an innovative system that directly burns used cooking oil collected from area kitchens in hotel boilers, providing heat to the guest rooms. This project achieves significant environmental gains, most notably by reducing annual greenhouse gas emissions by more than 200,000 pounds a year and eliminating the fossil fuels needed to transport the material offsite for recycling. The project represents just one of the many green initiativesspearheaded by Xanterra’s team at Yellowstone. For more information on the cooking oil to fuel project in Yellowstone and a photo slide show, you can read: From french fries to fuel: Yellowstone's new green energy. Yellowstone employee serving fries--and creating green energyNext time you enjoy an order of french fries while visiting Yellowstone National Park, you’re not only satisfying your appetite, but you’re also helping provide green energy for heating the park’s hotels. Xanterra Parks & Resorts, a concessioner in Yellowstone, recently designed innovative new equipment for its boiler system to allow for the direct burning of used cooking oil for fuel. 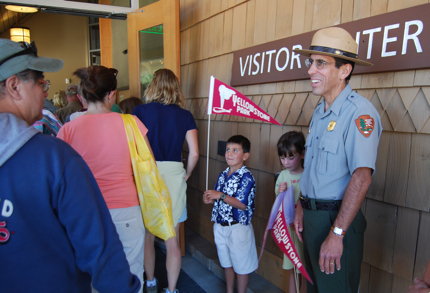 Yellowstone’s operations include a sizable food service component. On a typical summer’s day, Xanterra prepares over 22,000 meals in seventeen restaurants and eight employee dining rooms. On an annual basis, food preparation generates between 9,000 to 11,000 gallons of cooking oil. In the past, the used cooking oil has been shipped offsite almost 250 miles for recycling. To read the rest of the story visit my new Examiner site. The first leg of what I am dubbing my "Green Tour 2008" concluded today. For the past couple of days I've been attending the Montana Governor's Conference on Tourism in West Yellowstone and presented as part of a panel on "The Greening of Yellowstone." For the next week and a half, I'll be traveling around Montana and Wyoming on a series of speaking engagements on green business and the sustainability programs at Yellowstone. 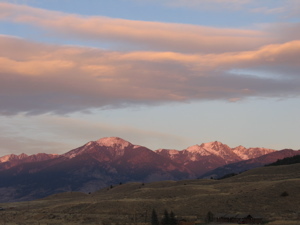 Tomorrow morning I head for Casper, Wyoming for the Wyoming Governor's Conference on Tourism, then back to West Yellowstone for a Yellowstone Business Partnership session, then onto Jackson Hole for another training. For this conference, we got to travel in style. 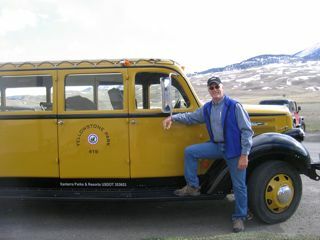 My co-worker Rick, the director of marketing for Xanterra in Yellowstone, drove us in one of the refurbished yellow buses that are now used to give tours in the park. At first I thought Rick knew everybody in a 100 mile radius because of all of the waves we received, but people just love these old fashioned yellow buses. The sessions were excellent and provided me with a good introduction to my new home state. Cheryl Charles, the President of the Children & Nature network (cofounded by Richard Louv, author of Last Child in the Woods), gave an excellent presentation about "no child left inside" and I had a chance to speak with her at one of the social events about developing green education for kids. 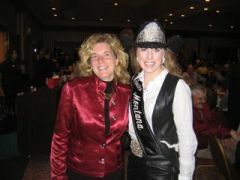 Other highlights: the Yahoo yodeling guy, Wylie Gustafson, taught all 400 participants how to yodel and provided the musical entertainment for our farewell dinner and dance, and I also got to meet Ms. Montana! Found this on the internet and I couldn't resist. I am going through 24 withdrawal since this season got postponed, damn it! ( 24 fans will understand the expletive). I used the photo below in my first environmental trainings in Yellowstone today and promised to loan out some 24 dvds as a result. By the way, if you haven't replaced your incandescent bulbs with compact fluorescent lighting (CFLs), what are you waiting for? CFLs are 75% more efficient than incandescents, last ten times longer, and with each bulb you replace, you'll keep a half a ton of CO2 out of the atmosphere. 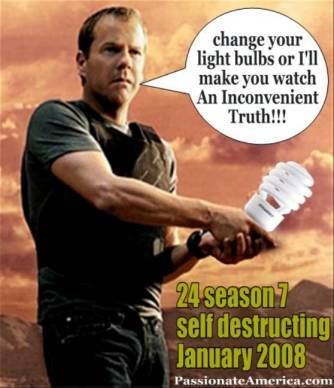 Replace your bulbs today-you don't want to mess with Jack. U.S. Senator Jon Tester (D) from Montana visited Yellowstone today, and I had a chance to meet with him as he was interested in the environmental programs in the park. I enjoyed our session, and was very impressed with his candor, sincerity, and intelligence. I was also impressed with his background. Senator Tester and his wife run an organic farm in northern Montana on the land his grandparents homesteaded over a hundred years ago. He also possesses a bachelor of science in music, and worked as a music teacher in the public schools early in his career. He shares a hometown of Big Sandy, Montana with Pearl Jam's Jeff Ament, and the band played a concert to support his run for the senate. It's pretty cool to be represented by a democratic senator from Montana who runs an organic farm, is interested in the environment, has an appreciation for music, and likes Pearl Jam. World Wildlife Fund is organizing Earth Hour on 29 March 2008 at 8pm, and it looks like the event is going to be really big. So far, as well as Sydney, there'll also be Adelaide, Atlanta, Bangkok, Brisbane, Canberra, Chicago, Christchurch, Copenhagen, Dublin, Manila, Melbourne, Montreal, Odense, Ottawa, Perth, Phoenix, San Francisco, Suva, Tel Aviv, Toronto and Vancouver all turning off their lights for an hour in the name of fighting global warming. And I'm sure there'll be more cities by March. Sign up for Earth Hour with me by visiting http://www.earthhour.org/user/Npps and join the movement! Many people still think of global climate change as happening in distant lands: the starving polar bears and melting ice caps certainly give cause for alarm, but most of us feel a separateness from images taken thousands of miles away. Yet our own backyard isn't escaping the heat (pun intended), it's just that the effects can't be captured as easily in a dramatic photograph. The global climate change phenomena is already having significant--and alarming--repercussions in our national parks. Last night I attended a great presentation by Dr. James Halfpenny at his center in Gardiner on global climate change in Yellowstone. Dr. Halfpenny has been conducting research on climate change since the early stages of his career, and directed the Niwot Ridge long-term ecological monitoring site in Colorado. I've followed Yosemite's situation closely, and Yellowstone faces similar issues, in general if not in specifics. While the studies I followed in Yellowstone involved mainly water (or the lack thereof given an earlier and earlier snowmelt), Yellowstone's biggest loss may be its wildlife. For example, the invasion of exotic flora that does not provide suitable forage for ungulates may threaten Yellowstone's magnificent bison and elk herds. Warming temperatures have already caused an increase of pine beetle infestations, which have reduced white bark pines, a prime source of grizzly bear food. Stephen Saunders, author of a recently released report on climate change in the park, observes: "If we continue to increase our emissions of heat-trapping gases, a disrupted climate will cause the greatest damage to our national parks ever." A recent feature article in High Country News: Unnatural Preservation, outlines the tough dilemma public land managers face with the consequences of climate change: they can become "zookeepers and gardeners" or "let wildlife perish." Imagine Yosemite's waterfalls running dry in February. Or Glacier National Park losing its namesake attraction. 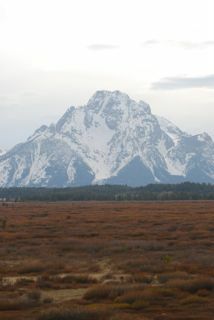 How about Yellowstone empty of elk and bison? Now doesn't that make you want to bike to work tomorrow or turn off that computer at night? I do feel pity for the folks I left behind in California. You are missing the experience of arriving home at 9:00 pm after having driven through a sparkling snowstorm with high winds blowing "cold smoke" across the road, and then having to shovel the snow drifts off your stairway in 10F weather. O the joy! A Yellowstone Business Partnership meeting today brought me for the first time to West Yellowstone, a western winter town in the truest sense--snowmobiles buzzed up and down the street during our visit. The low in West Yellowstone was -30F last night, and it didn't warm up much during the day as the windows on our car iced up on the inside even with the heat running full blast. For some reason, the ending of Jack London's famous story, "To Build a Fire" keeps occurring to me. More about the Yellowstone Business Partnership (YBP)--a truly inspiring organization and I'm honored to now be a part of their training team. The council has done unprecedented work in greening businesses in the Yellowstone area with its innovative "UnCommon Sense" business leadership program. Businesses enroll in a two-year program that features five group workshops along with a learning team leader who offers resources, coaching, and an accountability check. I carpooled from Bozeman with a great group from the environmental community: the Director of Environmental Affairs for Delaware North, the new Sustainability Program Manager for the YBP, and a manager for the Bozeman MacKenzie Pizza Company (my favorite pizza!) who transformed her company's culture as a result of her participation in UnCommon Sense. Other participants at the meeting included a retired physicist, the environmental manager for the Grand Teton Lodge Company, and a chemist developing products from potato processing by-products. I am really looking forward to working with this group!